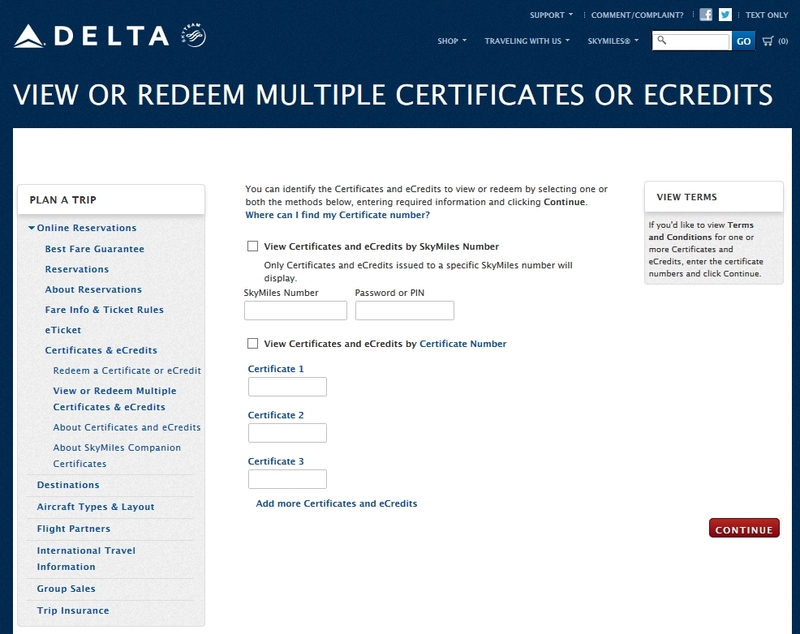 Reader Question: Is there a way to Redeem Multiple Certificates or eCredits (ETV’s or TCV’s) with Delta anymore? I got an email from a reader asking about using up more than one voucher at a time. Delta has seriously clamped down on this old feature that you can still access HERE on the Delta.com web site as you can see above. Delta did this, they say, to prevent fraud. I think they did it so many small $20 or $50 ones will just never get used and expire! But, if you try to use more than one, in most cases, it will just pick the top one you have put in. There are exceptions like the Medallion credit vouchers you can redeem as a choice benefit as those are still combinable. So are there workarounds for this? You bet. Thankfully, due to the broken Delta IT system, there are still ways for reps to do so many things we can not on Delta.com. So, if you get a nice rep, who understands what you want to do, they can often apply one of the ETV’s to you, and then another one to someone else in your party (notice you need more that one flyer here). I have a very few times, after explaining how hard it would be to use two small ones, had a rep use more than one on a ticket. I would love to know from readers what your success rate is at spending YOUR OWN CREDITS to buy a ticket! I also was very happy to realize that my eCredits were valid on AF/KL codeshares, so we were able to book AF flights with DL #’s. I actually used four on one trip last vacation trip out. Myself, my wife and my two boys. It couldn’t be done on delta.com so I called. They got me hooked up but what a pain. I had to have four different reservations. This sounds fine but each of us had checked luggage therefore they wanted to charge me for each one besides mine both there and back. I had to explain the situation very nicely over and over again. There more to the story but I will stop there. Needless to say they had better be worth more than $20-$25 in order for me to use more than one at a time again.